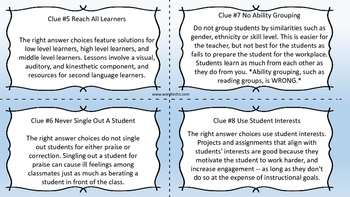 This sample packet of certification cards is targeted to help pre-service and active teachers who are preparing for the TExES. In TExES land, things are different and successful test takers learn not only what is taught in education courses, but also the way the state of Texas wants things done. 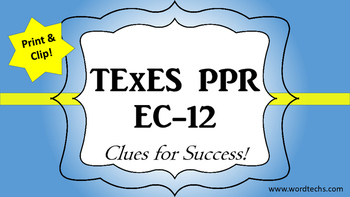 This Texas sized test can send a person to the poor house buying stacks of practice questions, software, flashcards, and books that may not help you connect the information or understand how the pieces fit together. As busy adults, we also don't have the time for crates of study materials. 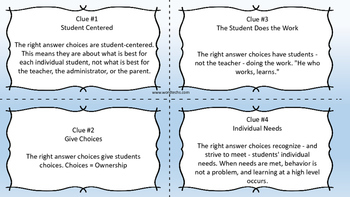 These are targeted to what is actually on the test, and the state's methods (information we receive directly from the Texas Education Agency). This is one of several mini-card sets that will help you master the basics -- in bite-sized chunks! Concepts are worded in clear language that matches the scenario-based monster test. The expectation is given as a clue, with a short phrase to help you remember the clue. Then, a clear explanation of what distractors you will see, how the state expects you to respond, and why they really are right. The state's best practices are research-based and work in the classroom. Directions: Print, Cut into Pocket Sized Cards, Carry and Study. Or flip through them on your tablet, phone, or computer. Can be uploaded to smart phones using any PDF reader. When done, file them and look for your next set. Then, come back to TExES and STAAR Study Solutions by WordTechs and snag your next set. NOTE: Paid card sets are larger (so worth the few dollars we ask), but still in bite sized chunks! Please, I'm new to TpT as a seller and am learning the ropes. Testing and remediation are our specialties, so if you need something specific, be sure we have it, and just ask! I welcome comments and especially suggestions of what you need. Even if you don't need these certification preparation cards, please share the link with contacts from your teacher college or other teachers you know that are working on this test. 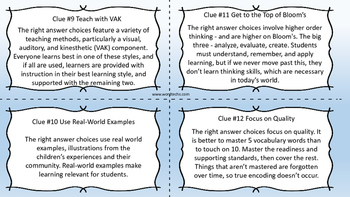 PRAXIS and Common Core test preparation mini-cards are in the works!